Now this one is really something for lovers of color, sparkle and detail ! 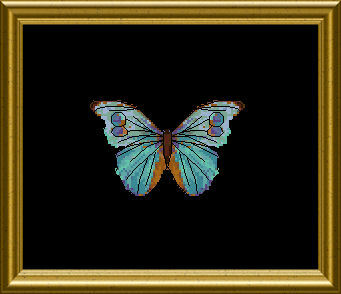 Beautiful butterflies can be stitched over one for extreme detail and shading, or over two, for an easier task to the eyes. A sparkling lace is the background for the eyecatching insects which fly around the center pond, where stylisized flowers add color and shape. 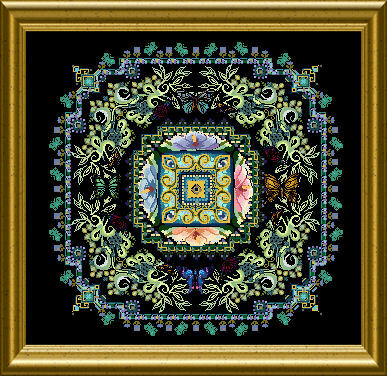 You will use beautiful variegated silks, cotton floss, perles and braids, metallics, beads and crystals to make this embroidery a genuine piece of (your stitching) art ! Blackwork parts, Special Stitches and lovelyl backstitched elements will add to the overal lacy look of this design. This really helps to see close up pictures of the actual stitching on a Chatelaine I am working on. Being able to go to this website to view it is so easy! Thank you Martina! 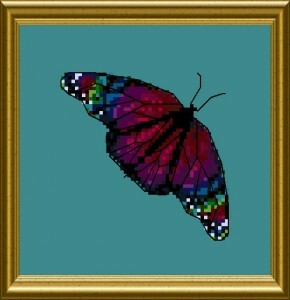 Please can I order Butterfly Lace pattern 0CF-ONL079. 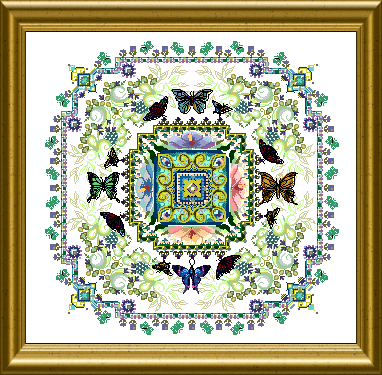 Do you have a materials list for Butterfly Lace Mandala? I would like to price materials to see what my total cost would be. Thank you for all your beautiful work. So sorry, Cathy – I do not distribute separte info on my designs – but you can perhaps find such a list on my FB Support group or the Chatelaine Yuku Board already. Does this desgn have a convertion thread list please.? Yes, for the threads where a conversion was possible the DMC is given. Hi,its me again Miriam Delicata i found where the conversion is .Sure i will study the chart well before starting it! I was wondering, what fabric was used in the pictures? I want to order the kit but I’m still trying to decide on the count of fabric to use. Hello! Where can I buy materials for the mandala? In addition to europeanxstitch.com. I am interested in ordering one of the mandala patterns, but it says when the PDF is sent NOT to download on or use a mobile tablet or cell device. I live in a bit on an internet dead zone in the country where my only connect is via a tablet with cell service. Why does this not work or is there another way to receive the pattern?